The Axiom C550n Series mSATA SSD combines performance and reliability with low power operation to make the ideal mobile drive. The high read and write performance will satisfy the most demanding power user. While the low power mode extends battery life for the road warrior. 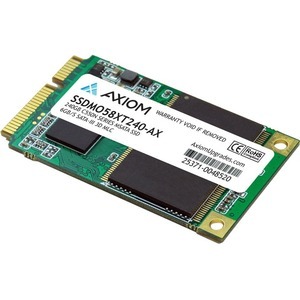 Providing an industry-leading bandwidth of more than 550MB/sec transfers, the Axiom C550n Series mSATA SSD can approach the limits of the SATA 6Gb/s interface on large transfers. Performance reaches enterprise class standards with up to 76,000 IOPS. A robust LDPC algorithm and StaticDataRefresh technology protect the data. Efficient bad block management and reduced write amplification further bolster endurance. Drive health is monitored using an SSD-specific set of S.M.A.R.T. attributes. The combination of these techniques provides data protection unrivaled in the storage industry.